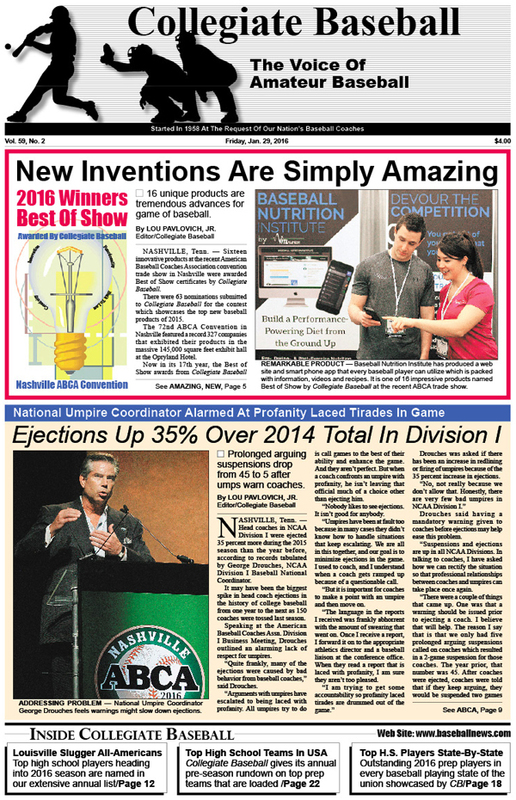 •Top Baseball Inventions Of 2015: CB examines 16 amazing products that win ‘Best of Show’ awards. • Ejections Up 35%: NCAA Div. I head coaches are tossed much more in 2015 than previous season as 150 coaches are ejected. A simple solution could be the answer. • Louisville Slugger Pre-Season H.S. All-Americans: Top high school players heading into 2016 season are named in our extensive list. • Top High School Teams In USA Entering 2016: No. 1 Coppell, Tex. is loaded with 5 pitchers who all throw over 90 mph entering season. • Top H.S. Players State-By-State: Outstanding 2016 prep players in every baseball playing state of union showcased by Collegiate Baseball in exclusive list. • Teaching Professional Of Year: UCLA Head Coach John Savage explains what methods he utilizes to be such a fabulous baseball coach. • Ruleball With Rich Marazzi: Quirky rule nearly affects outcome of Major League playoff game. • Charlie Greene On Coaching: Taking advantage of every opportunity is vital in quest for having solid team. • Editorial: The Late Wally Kincaid of Cerritos College was one of the elite baseball coaches in history who changed how the college game was played. • John Herbold Column: Trick plays have made games entertaining. • ABCA Convention Shatters Attendance Marks: 72nd annual event was the largest ever with 5,626 coaches in attendance — more than 1,000 more than previous record high. Additional records were set with the most exhibitors ever and the square feet of exhibit space utilized. • Numerous Awards Given At ABCA Convention: Special rundown on every award presented during convention is covered. • ABCA Convention Photo Pages: Some of the great moments of the ABCA Convention are captured. • Justin Dehmer Column: Here’s how to be more connected with your players. • Tom Kovic Column: Prospects must identify characteristics that help separate them. • Ron Polk Explains Game Speed Practice: This important element allows athletes to be at their best during games. To purchase the Jan. 29, 2016 edition of Collegiate Baseball or subscribe, CLICK HERE.